I would have reviewed this a year ago; after all, Funimation’s delectable release of this title was packed with physical goodness, artbooks and the like. The problem was that it was locked to Region A. I would have reviewed this six months ago, as the minute the Australian release was announced, I had it pre-ordered, and it showed up on my doormat not too long after the release date, except that there was a problem with the first Region B release from Sony Universal in Australia. The subtitles on the Blu-ray discs in that collection were out of sync with the audio. It isn’t the first time Sony Universal have had that problem with anime on Blu-ray, but I was determined to persevere with this release, and thankfully so were they. It’s taken this long for them to isolate the problem, correct it, and re-author new discs. I now have the show with the subtitles correctly synced up, and ready to review. After all, this is Serial Experiments Lain, the Yoshitoshi ABe cyberpunk series that rode the wave of the Internet explosion in the late ‘90s and delivered one of the most compelling and engaging sci-fi mysteries that anime has ever produced. It was no coincidence that this was also the show that sealed my pact with the anime devil. Having experienced it on fuzzy NTSC-PAL standards converted DVDs, you can bet I wanted to get my hands on an HD presentation of the show. You don’t have to worry about it being an up-scale either. 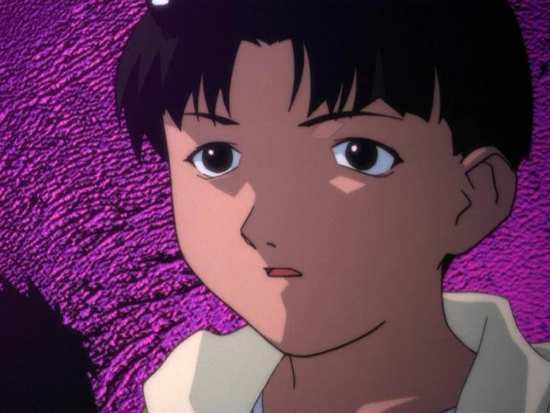 Animated in 1998, Lain was made with cel and paint, shot on actual film, ripe for a genuine HD presentation. Also, while it was a show that mixed and matched traditional with digital animation, the creators went back and restored and re-mastered the show for HD, going as far as re-animating those digital segments from scratch. They may have been animated in SD originally, but they are full 1080p compliant for the Blu-ray release. Serial Experiments Lain is the groundbreaking anime that introduced Yoshitoshi ABe to Western audiences. It takes place in a world where the Internet has become even more ubiquitous than in our own. Communication, friendships and relationships are defined by links created in the Wired as well as the real world. 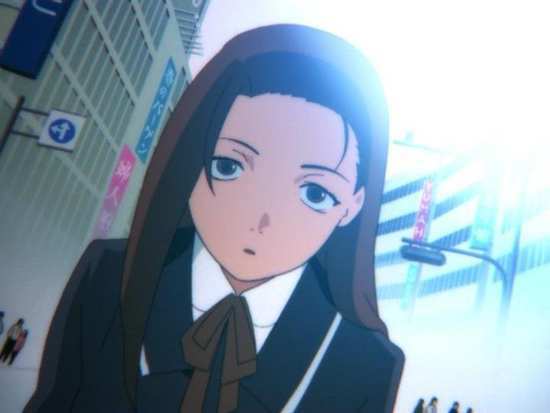 Lain Iwakura is a schoolgirl who isn’t as tech savvy as her friends, but a tragic event leads her into a fantastic world that has her questioning the nature of reality itself. Thirteen episodes of Serial Experiments Lain are presented across two Blu-ray discs from Sony Universal. Serial Experiments Lain gets a pillar-boxed transfer on these Blu-ray discs, one BD 50, and one BD 25. The original aspect ratio was 1.33:1 as you would expect for an old TV broadcast from the late nineties, but on this Blu-ray the scope has been opened up slightly to around 1.4:1. If all you have seen are those NTSC-PAL standards converted discs, then you are in for a treat with these episodes. 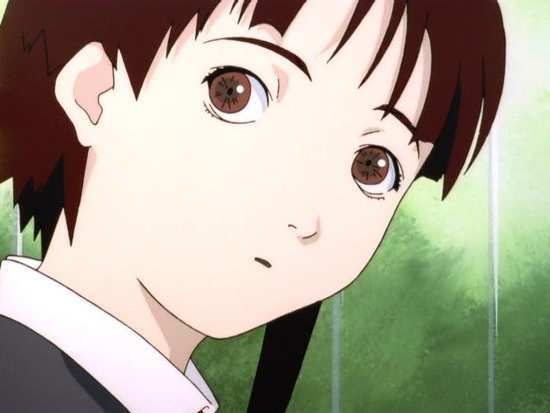 Serial Experiments Lain was animated on film, from which a native HD transfer has been struck. True there were some CG elements in the show, mostly video screens and monitor images and the like, and those were animated in NTSC SD, but for this release, the Japanese animation studio went back and recreated them in full HD. 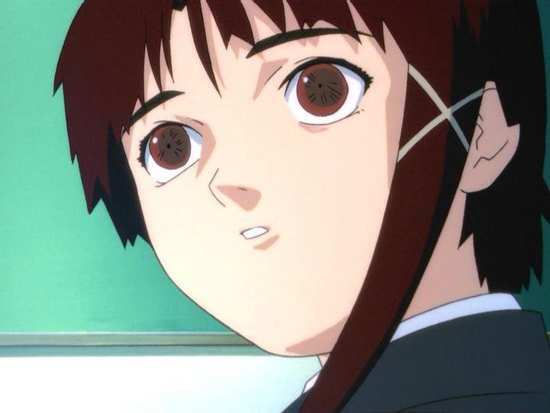 You get Serial Experiments Lain in full 1080p HD at 24 fps throughout. The digital elements now look superb, while the cel animation comes across with clarity and stability, as well as full detail, albeit with the odd fleck on the film. 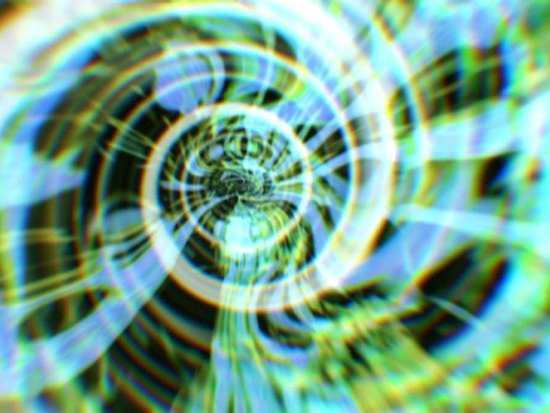 Having said that, Lain was never the most detailed of animations, and neither was it the most fluid. You have bold colours, and striking images, but a lot of the energy of the animation is accomplished in post production with digital effects, overlaying weird distortions and the like. Also some of the HD clarity gets lost when the camera zooms in on a scene. For ease of animation, and of budget, the shortcut of physically zooming in on a portion of the frame is used, and when that happens, it all begins to look a little SD. In addition, during the latter episodes where CG and 2D blended animation is in greater abundance, there are one or two up-scaled scenes, but it’s a small fraction of the overall footage. It’s also worth noting that this Australian release uses the same source as the Funimation disc, and there have been some complaints about digital banding. Apparently Funimation used different brightness levels than the Japanese release, and that had the effect of making digital banding more apparent. I certainly did note this banding straight from the first scene, and it is an issue, although the more I watched, the less it impacted on my viewing. A far greater issue because of the different brightness levels is that blacks are never truly black on this transfer, and the contrast is quite disappointing. The Blu-ray transfer could be better, but compared to my old MVM DVDs, it’s light years ahead in terms of clarity and visual impact. You can also compare it directly to the new DVD transfer in this set, and see that the HD is a considerable upgrade even to that. The images in this review are sourced from the DVD component of this release, and while not representative of the Blu-ray do give an indication of the quality of the re-master. You get the choice between Dolby TrueHD 2.0 Stereo English and Japanese, with optional translated subtitles and a signs only track. 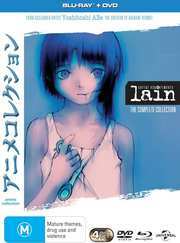 As previously mentioned, the first issue of Lain on Blu-ray from Sony Universal had a problem with mistimed subtitles, the corrected discs are identical in terms of packaging and artwork to the first set, but if you look at the barcode near the hub on the shiny side of the discs, the corrected set have ‘R1’ appended to the serial number. 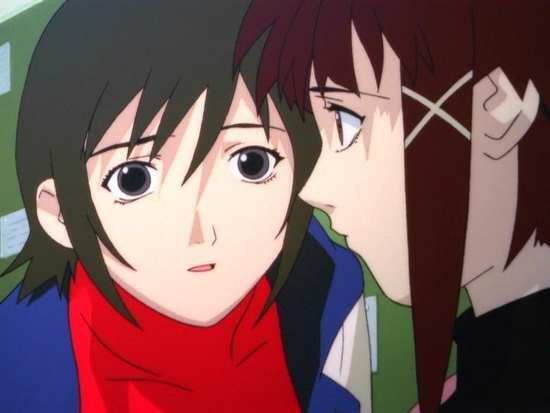 The stereo audio for Lain is put to some really good use, as this is a show with a strong and imposing sound design, where altered states of mind, character isolation, and the sheer oppressiveness of the technological dystopia has to be conveyed in both the visuals and the audio. 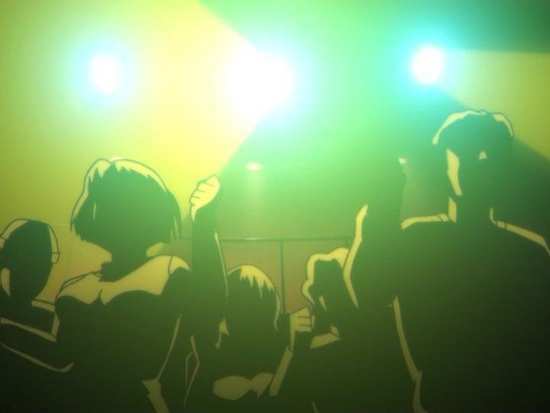 Eerily echoing footsteps, the hum of electrical cables, the dull underthump of a nightclub, the way the show subverts everyday sounds and makes it all unsettling and otherworldly is effectively accomplished here, and in terms of the Blu-ray’s lossless presentation, comes across well. The Japanese audio is the way to go here, but I gave the dub a try, and it is most definitely a dub of its time, getting a little creaky now, but still effective in telling the story. The dialogue is clear throughout, and BOA’s Duvet theme song has never sounded better. Sony Universal have cloned Funimation’s US discs for their release, albeit stripping them of the trailers, and opening out the Region Code on the Blu-ray to A, B and C, and on the DVD to 2, and 4. Unfortunately the wonderful physical extras of the US Limited Edition release have been ditched. You get all four discs in a conventional Amaray sized case, one disc at the front, one at the rear, and two either side of a central hinged panel. The case comes wrapped in an o-ring card which repeats the case art and blurb, but has a front pane that opens up to reveal more production art, and some more information about what is on the release. The DVD presentation is also on 2 discs, presented in 1.33:1 NTSC regular, and with Dolby Digital 2.0 Stereo English and Japanese, with subs and signs, and in terms of content offers the same as the Blu-ray discs, albeit with different episode counts on the discs and with static menus. One thing to note is that these DVDs are sourced from the same, new re-mastered Blu-ray versions, with the re-animated CGI. It also means that the video is now encoded progressively at 24fps on compatible equipment, which makes for a more pleasing viewing experience. The Blu-ray discs present their content with animated menu screens following a skippable Universal logo and the Australian anti-piracy thank you trailer. They use a computer window interface motif to present their options, windows that look suspiciously AmigaOS to me. As you would expect for an HD presentation, Funimation had to recreate the English language episode credits once more, and this time there is a list of Funimation personnel who worked on the Blu-ray release in the credits. What’s missing on this release are the next episode previews, the little live action bits that had Lain’s voice actress Kaoru Shimizu filmed to promote the next episode. Apparently the Japanese release had them in the extras (they were filmed in NTSC video, and would have been a lot harder to convert to 1080p HD and put them inline with the episodes), but apparently Funimation didn’t license them. 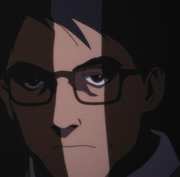 Funimation also didn’t licence the cryptic Easter Eggs that were on the Geneon/Madman/MVM release. Just once I would like to buy a Blu-ray and ‘retire’ my DVDs. The extras are all on disc 2, and merely amount to the promo video for the soundtrack CD, and a small collection of commercials, all presented in 480i, and taken from the original Geneon release. You’ll also find the textless credits and the trailer for this Blu-ray release, presented in 1080p. 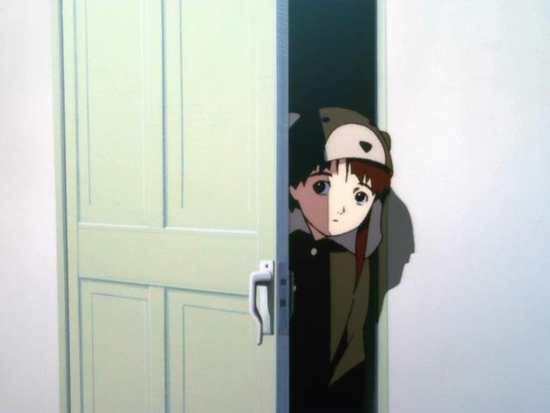 Serial Experiments Lain is a great show, brilliant, thought provoking, intelligent cyberpunk. However, it’s not the ‘Greatest Show Evah!’ that I once considered it to be, back when I first reviewed it and it single-handedly sucked me back into anime fandom. It’s suffered from a dip in its relevance, a phenomenon that I am seeing for the second time this year. If films and TV shows have a life-cycle, you might expect a degree of plateau when it comes to their popularity over time, and once they’ve found their place in mainstream consciousness, that plateau would remain steady. I find the same isn’t true for tech thrillers, where a great deal of their relevance and appeal comes from the technology used within. At the time of release, that technology would be cutting edge, even futuristic, but as time passes, the technology becomes dated, even twee and out of touch, and odd moments of what might have seemed like considered prescience at the time, turn out to be technological dead-ends. I revisited one of my favourite tech-thriller movies earlier this year, Sneakers, and for once I found its analogue, and cumbersome technology to be a distraction from the story. It’s reached that point where it seems quaint and old fashioned and only time will tell if the movie will regain its appeal and become a timeless classic like Wargames, or will become increasingly irrelevant as time passes. The same thing has happened to Serial Experiments Lain in my opinion, although not to as great a degree as with Sneakers. 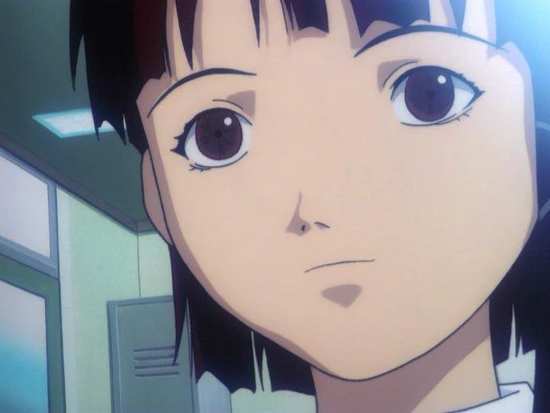 Serial Experiments Lain is a speculative bit of sci-fi that looks at the way people communicate and interact, and combines it with the, then nascent technology of the Internet. 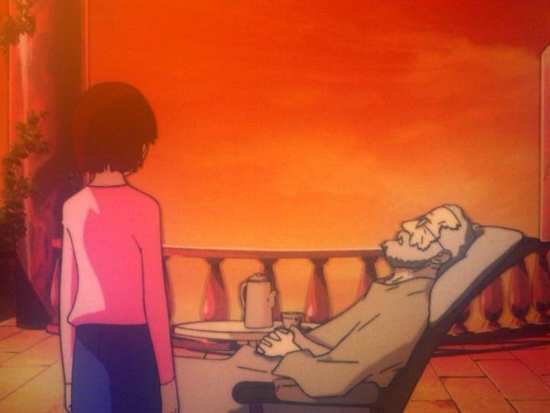 A lot of what this show predicted never came to pass, but you also have to remember that Serial Experiments Lain was made when the Internet was but 5 years old or so. Today, the Net experience is pretty much seamless, and the technology is invisible. Armed with a mouse and a computer, or a smartphone, or half a dozen other ways to get online, the world is your oyster, the hard work of coding, and connecting has all been done for you, and all you’re expected to do is point and click, or swipe. But those early netizens of the late nineties had it harder. Simply pointing and clicking was possible back when most web pages were hosted by Geocities and existed in garish nightmare Technicolor, kicking to a Midi beat, but to get the best out of the Internet, you also had to venture into Newsgroups, you had to know how to FTP, you had to know IP addresses to connect to other computers, as HTTP didn’t always work. It also didn’t hurt to know a little UNIX, and know your way around a motherboard, and spend more time upgrading your kit than actually using it. 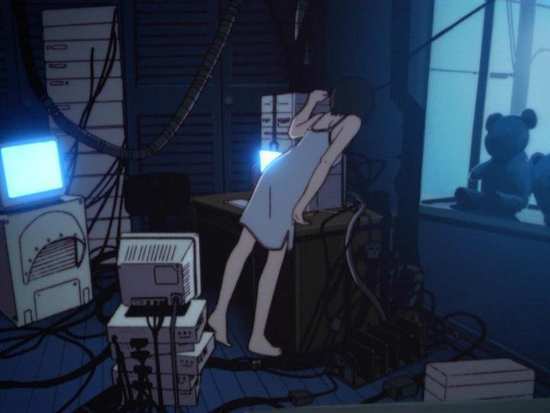 That was the world of the Internet as existed when Serial Experiments Lain was made, and that is the world that it extrapolates to its near future setting, where high school students are taught how to code in C, and while people may have smartphones of a sort, and high powered computers at home, they still tinker, and know what jumper settings to use. 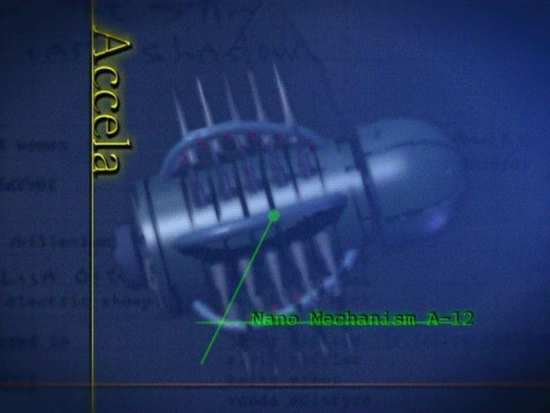 The kind of kit that they use in Serial Experiments Lain, the technology that they foresaw, is now gathering dust in sheds, garages and attics, and the world has moved on. It isn’t quite as dated as Sneakers, but age is beginning to show, although virtual reality goggles never looked cool. Another aspect of the show that is beginning to show its age is the conspiracy theory angle to the story, and it’s quite obvious this show was made at the height of The X Files’ popularity. A couple of expository episodes throw everything in there, from the crash at Roswell to Lain’s own Men in Black, and an illicit project to awaken the psi centres in the human mind. But for Serial Experiments Lain this is really just window dressing, as the central core of the story still remains strong. Its tale of a girl being drawn to the Internet, or the Wired as it’s called in the show is still compelling. The suicide of a classmate sparks a lot of frenzied gossip in class when e-mails from the dead girl start appearing in inboxes. 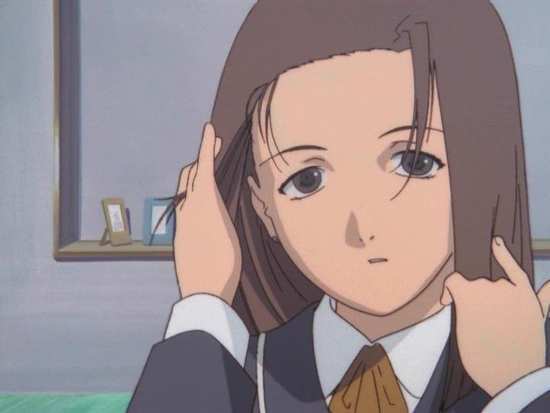 Lain’s curiosity about this draws the previously technically illiterate girl to the Wired, and sure enough there is an e-mail waiting for her, as is the revelation that death isn’t all that permanent, and that there exists an afterlife of sorts in the Wired. And it seems that Lain is already there. 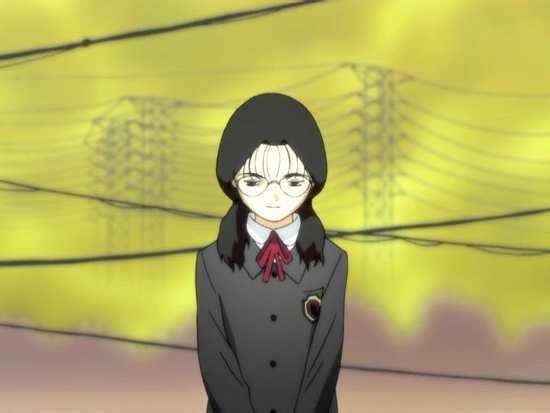 Her friends at school are curious as to what the meek and introverted girl was doing at the Cyberia Nightclub, albeit with a wholly different personality, and people make mention of Lain of the Wired. Sure enough, it becomes clear that consciousness of sorts exists beyond the body, and it isn’t merely people sending avatars of themselves online to communicate. How people communicate online is becoming more and more enmeshed with how they communicate in real life, and pretty soon the unreality of the Wired begins to overwhelm the real world. As the two worlds begin to blend, and it becomes clear that whoever controls the Wired controls the real world, conspiracies arise to take control of the Wired, conspiracies for which Lain will be a key player. 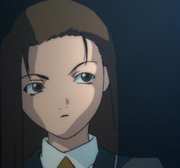 And it leads to Lain questioning the nature of her very existence. It’s a great, mind-bending story that explores how people communicate, the nature of reality, of thought and consciousness. It’s one of the strongest cyberpunk shows I know, thought-provoking and multi-layered. Each time I watch it, I see it with fresh eyes and find a different angle to appreciate. This time, the show’s technology is beginning to look old, but the story most certainly isn’t. I won’t be surprised if in another ten years or so, once we’ve cleared out our sheds and attics of old kit, and have truly put out of mind the Wild West years of the early Internet, that this show will have gained timeless classic status. The Blu-ray release of this show is good, but not great, with digital banding issues and a couple of up-scaled scenes near the end letting the side down. Otherwise, watching this show in HD quality and with lossless audio makes this release leagues ahead of my old MVM DVDs. The DVD component of this release is also struck from the same upgraded master as the Blu-ray, and it too looks pretty spectacular when it comes to SD, again an upgrade over the original DVD release, but losing the next episode previews and the Easter Eggs means that I can’t use that extra room on my DVD shelf just yet. Still, I have no regrets in this double dip. One of the best anime shows of the 1990s made shiny for the 21st Century.